Occasionally, we may have accordions in stock that have come in as a part exchange that we wish to move on quickly and cheaply. These instruments are normally in a playable condition, but might be in need of a bit of internal work to get them back to their former glory. Alternatively, many of them are mechanically sound, but may have cosmetic damage that unfortunately devalues them. Also, we sometimes have accordions come in that are simply not be the usual type of instrument that we wish to have in stock for an extended period of time. 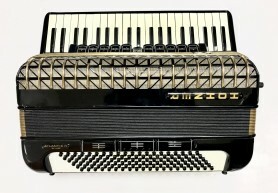 Accordions that fall in to one or all of these categories are sold in our clearance section at rock bottom prices to clear. Please note that all instruments in this list are sold as seen without a guarantee.